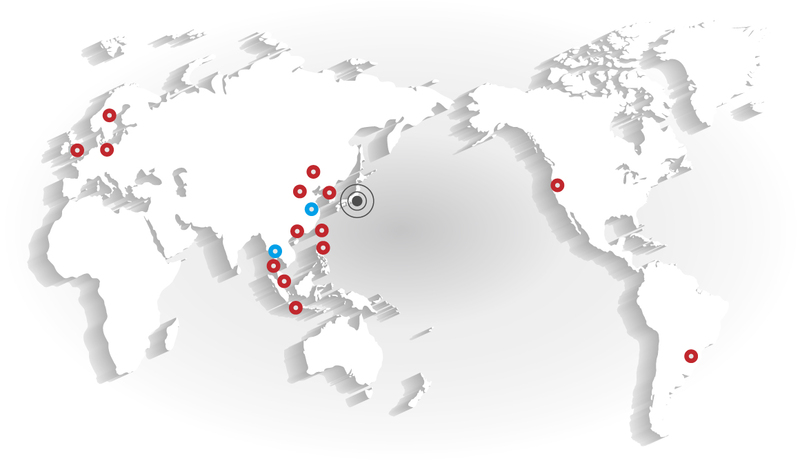 Nihon Almit engages in the research and development of products that innovatively advance world standards. We also focus our efforts on universal ecology to contribute to the global environment. that meet the needs of the times is important to us. complex consideration and understanding of client problems and demands. sales information systems in order to achieve sincere relationships with clients in Japan and across the globe. in tune with the environment to bring joy to the next generation. Company Name NIHON ALMIT CO.,LTD. 1956.3.19　 Company established and is simultaneously successful with the practical application of aluminum-use solder. by the Science and Technology Agency. 1976.8 A world first, non-chlorine high-efficient resin-core solder KR-19 is developed. 1982.6 Nihon Almit’s solder KR-19RMA is adopted for use on NASA space shuttles. 1991 Capital funds increased to 50,000,000 yen. 1992.5 Micro Joint Laboratories established in Akiruno-shi. 1995.2 New headquarters building completed in Yayoi-cho, Nakano-ku. 1997 Production Technology Center established in Uenohara, Yamanashi. 2001 Production Technology Center #2 Production Management Building completed. 2001.9 Nihon Almit (all companies) receives ISO 9001 Quality Management Systems certification. 2003.3 Nihon Almit & Micro Joint Laboratories acquire ISO 14001 Environmental Management Systems certification. No.1 WORKSHOP.THEWEST OF JIABAO ROAD. FOREST ROW, EAST SUSSEX, RH18 5DW, U.K.
NO.23 LANE 343 CHI LIN RD.,TAIPEI. SHANGHAI KURODA TRADING CO., LTD.